I bought this dryer about 3 years ago after saving for weeks with every intention of buying the matching washer when I saved enough money for that. This dryer has been nothing but trouble since the day that I purchased it. So far in the past 3 years we have put 2 new belts and new plastic gliders on this machine. We have just finished putting our 3 and final belt on the machine. I say final belt because now I am in the process of looking for a new dryer. There are 5 people in my home so there is always lots of laundry and I cannot stand this maching any longer. 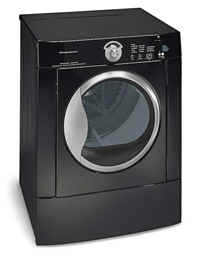 If you want a dependable dryer for a large family, please do not purchase this machine, it will give you nothing but headaches and the drying time is about 70 minutes on the highest setting so not very energy efficient. Just after warranty was up rear spindle wore in to then heating element failed. Now at only five years old the controlls in the front panel. Caught on fire we were lucky our daughter was home this machine is crap. I have had the same problems, it has ruined lots of clothes and now no longer even dries anyting on the timed drying, and barley dries on any other setting. WASTE OF MONEY! !